Wild West Look at Gambling for Children. 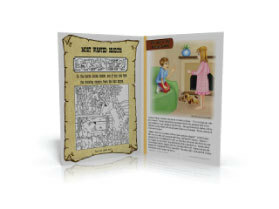 A Downloadable Kids' Magazine PDF Booklet (20 Pages- No commercial) with the MP3 Audio Adventure One-armed Bandit- Now with Bonus Educational Sheets! Welcome to Daisytown, home of brave cowboys and talking horses. Learn about gambling addiction as young Clayton meets the Armstrong family. His faithful horse Butch tells him the sad story of Mr. Armstrong, who lost all he had to the one-armed bandit. Experts claim teen gambling will reach epidemic proportions in the next few years. Your vulnerable kid has been exposed to celebrities glorifying poker and online gambling. Don’t believe me? Just have a look on some popular kid’s social media. It is urgent that you educate your kid how gambling can lead to serious consequences, just like you did for drugs, talking with strangers and alcohol. (No, I’m not talking about starting a campaign to shut down your local casinos). As a parent, don’t wait another day to prepare your kid to discern between having good clean fun and what appears to be harmless behavior but leads to a path of destruction. Audio adventure over 25 minutes of entertainment in downloadable MP3 format. Compatible with your kids’ portable audio player. It will be very hard for them to stop listening! The accompanying magazine includes supporting articles, puzzles, and of course, a mystery. Reinforce the concepts learned in the audio drama. Save time and money. No need for you to look for bits and pieces of materials on this topic all over the place, it’s all here in one package. Immediate download so you can start teaching and having fun right now! Preview the Intro and a Scene From "One-armed Bandit"
Samples a page from the kids' magazine. I will also give you my "Bonus Sheets"with your purchase. Perfect for parents & homeschooling. Classroom teachers will be delighted as well. Spectacular graphics that will keep your child interest. They will also look good in black and white if you want to save on expensive printer ink. Promote social interactions and parental bonding. Foster critical thinking and moral intelligence.